Northwest Passage: Hair and Space Museum at Bumbershoot’s Skyward! A couple of months ago, David and I were approached by curators Jana Brevick and Shelly Leavens about creating a piece for the Skyward! exhibition at Bumbershoot. Specifically, they wanted us to make something that would provide the entry point of the exhibition, creating a transitional zone that would help usher festival-goers out of the headspace of the festival—with its multiple music stages, Toyota raffles, and carnival snacks—and into the exhibition, whose theme is centered on the 50th anniversary of the Seattle World’s Fair, and how Seattle was once marketed as the shining City of the Future. Hair and Space Museum. Northwest Passage (installation view). 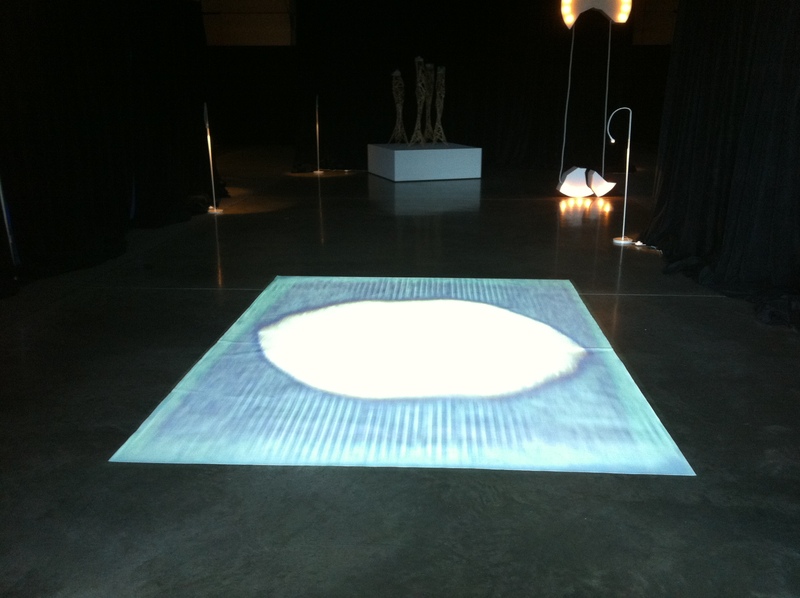 Processed multi-channel video feedback, vinyl, sound, 2012. The prospect of creating a site-specific work of art in the entry point to the exhibition presented some unique challenges. There was an expectation that our work serve as something of a passageway, both physically and conceptually. In planning our Bumbershoot piece, I found myself thinking about certain works we had seen in an exhibition by Marianne Nicolson at the Art Gallery of Greater Victoria back in 2007. Nicolson, who is Kwakwaka’wakw, created, among other things, a series of light boxes featuring surfaces etched with traditional tribal motifs. One of these boxes, mounted in the center of a room filled with paintings and objects, illuminated continually with a low-level light that cast very subtle shadows on everything in the room. I didn’t notice the shadows at first, and when I did, I had a small epiphany. The history of the Pacific Northwest contains multiple histories—in this case, the history of the indigenous people of the region—which are, of course, always casting their shadows on the present moment whether we notice them or not. Nicolson’s work stuck with me because of how it collapsed multiple moments of time in a given space, and the theme of Skyward! seemed to call for a similar investigation of the multifaceted nature of the narratives it implies. Seattle’s pioneer spirit is amusing, even endearing in its innocent exuberance, but it is also heavy, because of the often unanticipated (yet ever present) consequences of exploration and expansion. Hair and Space Museum’s piece for Bumbershoot is titled Northwest Passage, after the fabled thoroughfare explorers once hoped to find in our region’s labyrinthine waterways. It consists of an ambient, cosmic soundtrack and a set of two projectors and cameras mounted into the ceiling, creating a pair of mirror-image feedback loops that are continually projected onto a screen on the floor which dominates a threshold that people must walk through to enter the exhibition. The feedback loops are modulated by an analog video synthesizer, whose patches will be changed to generate different effects and interactive possibilities during the course of the festival. 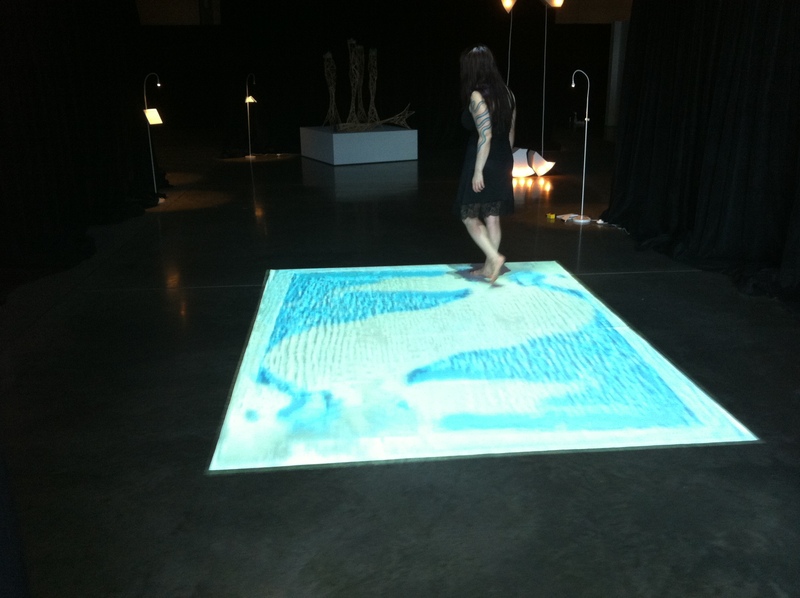 Once a person walks across the floor, their presence transforms the projected image, blazing a virtual trail in their wake. In the absence of visitors, the feedback system eventually returns to something of a self-sustaining stasis. Skyward! opens today (Friday, August 31) with a preview reception at Fisher Pavilion, and will be open throughout the course of the festival. The exhibition also includes interactive works by I Want You , Vaughn Bell & Iole Alessandrini, Heather and Ivan Morison and Hollow Earth Radio’s Garrett Kelly and Amber Kai Morgan, among others. ~ by emilypothast on August 31, 2012. Tags: Bumbershoot, Hair and Space Museum, Northwest Passage, Skyward!